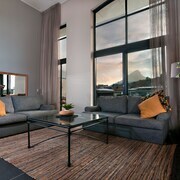 Lovely apartment & helpful staff The executive two bed apartment had stunning views to Table Mountain, very spacious, well equipped, clean and comfortable. 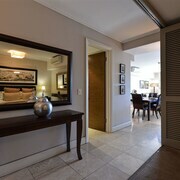 Located in Camps Bay, this luxury aparthotel is within 1 mile (2 km) of Clifton Bay Beach and Camps Bay Beach. 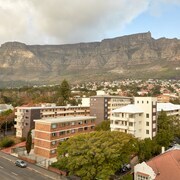 Kloof Street is 2.9 mi (4.7 km) away. Hôtel at the beach We had an Apartment with 2 sleepingrooms. 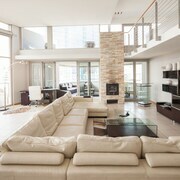 Not the most modern one but with oceanview right on the beach. 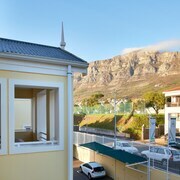 View to the table mountain included. It's in a save region with very good security. 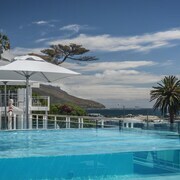 Sprawling alongside sparkling azure waters, and backed by the iconic outcrop of Table Mountain, Cape Town is one of the world’s most scenic cities. 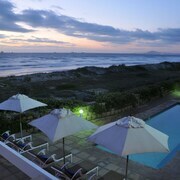 If you love surfing, mountain hiking, paragliding or just taking in the sun on a panoramic seafront, this is a place that will tick all your holiday boxes. 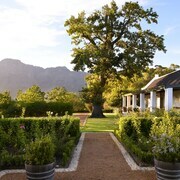 Nature is a big deal here, from the coastline to the placid zebras on Table Mountain, but the city itself makes for exciting days and nights, whether you’re visiting the numerous art galleries or checking out world-renowned restaurants and bars. 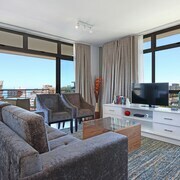 Cape Town holiday rentals are ideal for making a temporary second home in South Africa’s most cosmopolitan and multi-faceted metropolis. 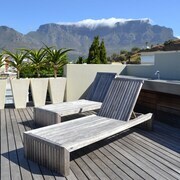 Why book Cape Town holiday rentals with ebookers? 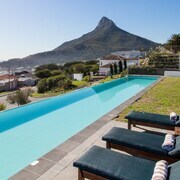 Whether you fancy staying in the heart of the city centre, or near the fine sands in affluent, chic Camps Bay, there are Cape Town holiday rentals scattered throughout this colourful corner of South Africa. 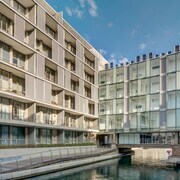 While hotels are certainly one route to go down, having your own, private pad will make you feel like an instant local, no matter how long you’re intending to stay. 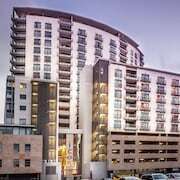 You can also enjoy a larger living space and fully equipped kitchen, for rates likely to be considerably lower than a traditional hotel. 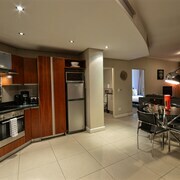 You can settle into your Cape Town holiday apartment, enjoy cooking your own meals whenever you want, and have the perfect base for exploring at your leisure. Be sure to pack plenty of sun cream, because Cape Town’s beaches will demand your attention. All you have to do is choose between various hotspots. Camps Bay Beach is one of the most sumptuous, with bright white sands, lazy palms and a well-heeled atmosphere that draws in the wealthy locals. 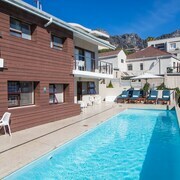 Another irresistible attraction is Fish Hoek, a seaside community that boasts its own places to bask by the lapping waters. 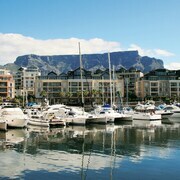 Table Mountain looms over everything in these parts, and you can see it up close by taking the breathtaking Table Mountain Aerial Cableway, right to the top. 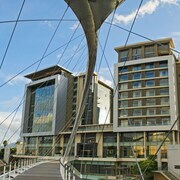 A particularly buzzy place to mingle and sightsee near Cape Town holiday rentals is the V&A Waterfront, which boasts hundreds of shops to browse, along with family-friendly restaurants and clamber aboard boat cruises that let you see the bay in a whole new way. One of the most poignant things to do is to take a ferry to Robben Island, where Nelson Mandela was kept prisoner for so many years. As you might expect from a major city, Cape Town has an extensive bus network, along with communal minibus taxis that make for an exhilarating and cost-effective way to get around. 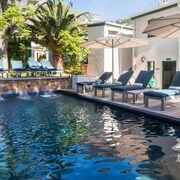 That said, you might find hiring a car to be your best bet for really getting the most out of your holiday – there’s no easier way to get out and explore beautiful areas like the Blaauwberg Coast, with its beaches and nature walks, and the relaxing environs of Kalk Bay.